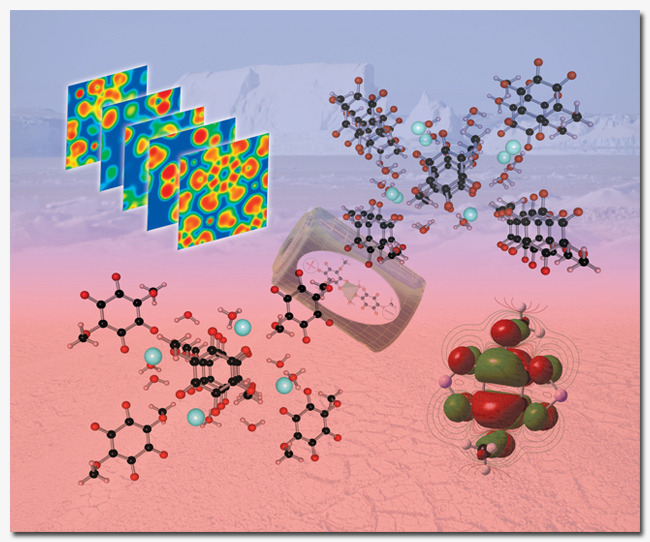 In press, in CrystEngComm (DOI:10.1039/C2CE26523). This is my first full paper completely internet-powered, in that I’ve not physically met any of the other co-authors (also in the internet-powered context, the recent paper on -annulene was written and submitted without sharing a room with Dr. Bruce Hudson, but we’re in the same building, so it doesn’t quite count). Also, one of the few papers for which I had no image generation duties (a rare treat). The discussion of the very interesting possibilities of molecular redox materials in lithium-ion batteries aside, this paper presents a very thorough example of the power of computational approaches to greatly improve the understanding of solid-state molecular materials by (specifically) 1: overcoming the hydrogen position identification problems inherent in X-ray diffraction methods, 2: reproducing the changes that come with temperature variations in molecular crystals and explaining the origins of those (possibly subtle) changes by way of dispersion-corrected density functional theory, and 3: demonstrating that the nature of intermolecular interactions (specifically hydrogen bonding) can be rigorously cataloged across varied materials using post-optimization tools (in this case, using Carlo Gatti’s excellent TOPOND program). Following our first experimental and computational study of the room temperature (RT) form of the tetrahydrated 3,6-dihydroxy-2,5-dimethoxy-p-benzoquinone (LiM2DHDMQâ‹…4H2O) compound, we have researched the occurrence of hydrogen ordering in a new polymorph at lower temperature. The study of polymorphism for the Li2DHDMQâ‹…4H2O phase employs both experimental (single crystal X-ray diffraction) and theoretical approaches. While clues for disorder over one bridging water molecule were observed at RT (beta-form),a fully ordered model within a supercell has been evidenced at 100K (alpha-form) and is discussed in conjunction with the features characterizing the first polymorphic form reported previously. Density functional theory (DFT) calculations augmented with an empirical dispersion correction (DFT-D) were applied for the prediction of the structural and chemical bonding properties of the alpha and beta polymorphs of Li2DHDMQ·4H2O. The relative stability of the two polymorphic systems is evidenced. An insight into the interplay of hydrogen bonding, electrostatic and van der Waals (vdW) interactions in affecting the properties of the two polymorphs is gained. This study also shows how information from DFT-D calculations can be used to augment the information from the experimental crystal diffraction pattern and can so play an active role in crystal structure determination, especially by increasing the reliability and accuracy of H-positioning. These more accurate hydrogen coordinates allowed for a quantification of H-bonding strength through a topological analysis of the electron density (Atoms-in-molecules theory).